A 12 month renovation of the building's facade and key public spaces to begin in August. Throughout the past eight years, Lani and I have stayed very involved, and with great pride watched HSA grow stronger, expand its programs, and once again become a pillar for art and culture within this growing population it serves. 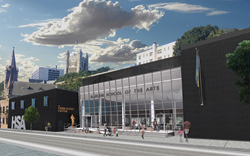 The 55-year-old Harlem School of the Arts (HSA) at the Herb Alpert Center, today announced the start of a major construction project that will significantly transform the 37,000 square foot facility, located at 645 St. Nicholas Avenue. Work on what is being called, The Renaissance Project, will take a full year to complete and is scheduled to begin in August. This renovation project is the most ambitious undertaking by the organization since the building was constructed. Legendary musician, philanthropist and celebrated artist Herb Alpert and his wife, Grammy Award-winning vocalist and author, Lani Hall Alpert are generously funding the full project cost of $9.5-million through the Herb Alpert Foundation. The Harlem School of the Arts, was founded by Dorothy Maynor in 1964 with 20 students in the basement of St. James Presbyterian Church. At the time, the neighborhood had few cultural resources for its residents. Almost five decades later, the school occupies a spacious building with specialized spaces for arts education, which includes 3 dance studios, several music practice rooms, dedicated visual art studios, a state-of-the-art media lab, and one of the few Black Box theaters in New York City. HSA touches the lives of approximately 3,000 young people annually through programs provided at the facility and in New York City schools, and reaches thousands more through a growing variety of public programs for people of all ages. Herb and Lani Alpert have been an essential part of the organization's rejuvenation since 2010, when they, along with several others, responded with an influx of much-needed capital when financial struggles forced its closure. Since then, the couple has maintained their interest and connection to the organization and its mission to provide all children access to quality arts education, world-class training, and exposure to the arts across multiple disciplines. Herb, a recognized and highly respected visual artist with a body of work including paintings and sculptures that have been exhibited in galleries across the country and around the world, has taken a personal interest in the HSA project and remains involved in every aspect – a measure of how significant an impact he believes this will have on the future of HSA, the students and the community. An impressive project team has been brought in to collaborate on the modernization of the award-winning HSA building, originally designed by German-born, modernist architect Ulrich Franzen, back in the 1970s. The first order of business will center on replacing the “Brutalist style” brick exterior, with a swath of clear glass to open up a panoramic view of the facility. Next the interior main public/gallery space will be retrofitted and transformed into a light-filled, high-tech, state of the art performance room – carefully calibrated, incorporating both cutting edge architectural and acoustical design worthy of the school’s emphasis and focus on quality arts education and world-class training. This important transformation of the building is in line with the organization’s vision of becoming a premier cultural destination that engages community participation, attracts audiences from everywhere, and maintains its commitment to its mission of grooming the next generation of creative thinkers, innovative leaders and artists. It also allows the organization to expand its programming and optimize its space for a wider array of events. The Renaissance Project will be led by Imrey Studio LLC – a respected New York-based, woman-owned design studio founded by Celia Imrey. Imrey has worked on a long list of high-profile architectural projects involving new construction, space renovation and new façade, including work on the Louvre-Lens, Rubin Museum, and the New York Public Library. The architect of record, Eric Daniels brings over 30-years of experience in architecture and interior design, with a focus on high-end residential and commercial projects. Architect and acoustician John Storyk will provide architectural and acoustical consultation and planning on the project. John is a founding partner and director of design at Walters Storyk Design Group (WSDG), and is known as a leader in his field. He is credited with designing over “3500 world-class audio/video production facilities, including studios, radio stations, video suites, entertainment clubs and theaters,” among them, the famed Jimmy Hendrix’s Electric Lady Studios. The overall Project Management is being provided by Seamus Henchy and Associates, who have been providing their services to many of New York City’s pre-eminent arts and educational organizations for the past 35 years. Among them – Lincoln Center for the Performing Arts, The Juilliard School, School of American Ballet, Ballet Hispanico, New Jersey Performing Arts Center, MoMA , The Brooklyn Museum , and The New York Botanical Garden. facilities and the renovation work to begin at HSA will bring an influx of new foot traffic and will surely have a transformative effect on the entire community. Before the Alpert’s decision to fully fund The Renaissance Project, the Harlem School of the Arts had already been the beneficiary of approximately 7.5 million dollars of the $180 million distributed by the Herb Alpert Foundation, in support of a variety of arts education programs. That figure has now jumped to $17 million gifted to the Harlem School of the Arts through the Foundation. The philanthropic generosity of Herb and Lani Alpert serves as a catalyst, encouraging other donors to contribute directly to organizations who have arts and STEAM programs at the heart of their mission. Their generous gift enables the awesome task of shaping and empowering future generations of creative thought leaders. as Westchester County and the tristate area, which includes Connecticut and New Jersey. HSA’s alumni and faculty are counted among the most talented leaders in the arts. For over 50-years HSA has enriched the lives of tens of thousands of people through world-class training in the arts. HSA offers its students the freedom to find and develop the artist and citizen within themselves in an environment that teaches discipline, stimulates creativity, builds self-confidence, and adds a dimension of beauty to their lives, empowering them to become the creative thinkers and innovative leaders of tomorrow. To learn more about the Harlem School of the Arts, please visit http://www.HSAnyc.org. The Herb Alpert Foundation envisions a world in which all young people are blessed with opportunities that allow them to reach their potential and lead productive and fulfilling lives. Over the past few years, the Foundation has focused on core areas, such as “The Arts,” a broad category that includes arts education, a focus on jazz, and support to professionals. This also includes programs that seek to use the arts to help meet the needs of underserved youth and to help build competencies that will enable them to become successful adults. The other core area is “Compassion and Well-Being,” which celebrates the positive aspects of human psychology and seeks to bring more empathy and compassionate behavior into our society. Please note: the Foundation does not accept unsolicited proposals.